Try the BYODPortal.com service free for 45 days. The service will work with both Connected Cloud and On-Premise VSP implementations. If you would like to try on the onpremise version, please contact your MobileIron Sales Representative. The BYOD Portal provides an easy and customizable end user device registration experience and self service device management portal. It can simplify and automate registration and management of iOS, Android and Windows Phone devices. By following the easy, self-explanatory workflow, your users will effectively register their devices, your process will scale, and your help desk won’t be bothered. And in addition to providing a simple registration process, the BYOD Portal also contains management functionality that enables IT to 1) Define and customize the workflow – required steps and approvals, and 2) Set parameters for the types and number of devices a user can register. For the end-user, there are several capabilities in the portal that enable ongoing self-service management of the device. Functionality such as lock, unlock, wipe, locate, and retire enable continued device management without IT support. Offered as both a cloud service or on-premise solution, the BYOD Portal is fully integrated with the MobileIron Mobile IT infrastrcture. Looking to run this onsite or have further customizations you need? BYOD Portal is also offered as an open code on-premise web application. 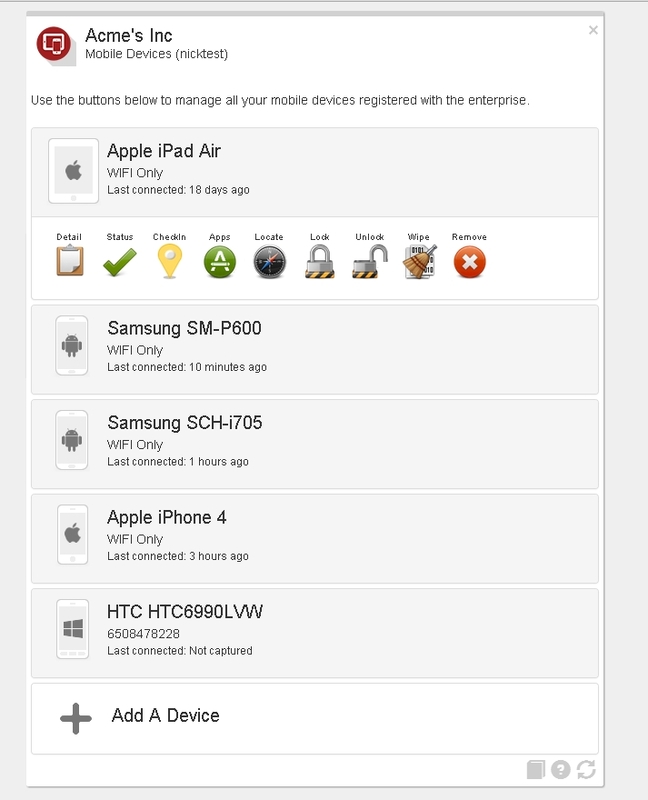 This allows you to customize BYOD Portal in any fashion you like - appearance, workflow, integrations, etc. All you need is a linux web server. Customization/integration services available. Contact your MobileIron Sales Representative for more information. See how easily a user can enroll, manage, and configure a BYOD or corporate owned device by simply scanning a QR code. QR Code enrollment saves a user between 30-60 touches on the device during a device enrollment. Limit the number and types of devices users are allowed to enroll. Ability to self-register new devices in a simple fashion, including QR code enrollment. Open code access provides the ability to modify company registration workflow (new pages, steps, complex business logic, custom integration with third party systems, etc), add and enhance functionality, and further customize the portal appearance to fit more specific requirements. The possibilities are endless.